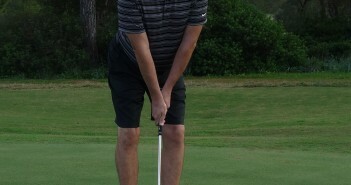 The Glute Bridge with Adduction Exercise will develop the muscles of your hips, improving the consistency and power of your golf swing by increasing the stability and strength of your lower body, and it will decrease your risk of injury. The Glute Bridge with Adduction Exercise forms part of the Golf Strength and Endurance series of innovative and dynamic exercises that are designed to efficiently increase your stabilising strength – supporting proper body alignment, movement patterns, and energy transfer within the golf swing, and helping to prevent injuries. Squeeze a ball, pad, or towel roll between your knees. Gently exhale and lift your hips up off the floor, keeping your abs engaged, until your knees, hips, and shoulders form a straight line. Press your heels into the floor for added stability. Squeezing something between your knees will force you to work the muscles on the inside part of your thighs.